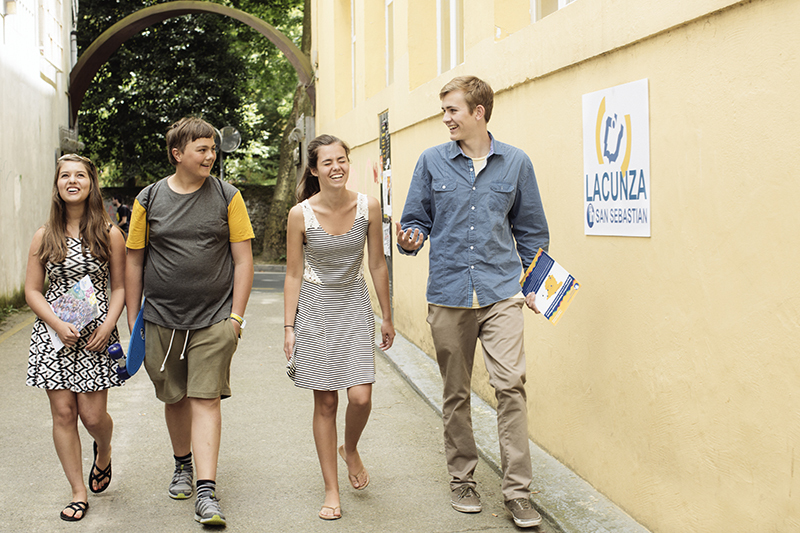 Lacunza exists for over 40 years and is one of the oldest language schools in Spain. The school is located on the edge of downtown. There are air-conditioned classrooms. The students can use computers (with internet), a canteen with coffee and soda machines and the terrace. The adult learners also have lessons at this location, but during the lessons you will be with students of your own age. Accredited by the Instituto Cervantes, member of FEDELE, IH etc. The social programme which forms part of the intensive (14-17 years) course is a combination of what San Sebastian has to offer: culture, sports, history and events. The programme includes 3 afternoon activities per week and a full day excursion. Examples are: city tours, bike tours, sports activities like zumba and hiking, picnic, visits to amusements parks, cinema at school, scavenger hunt, boat trips and excursions to for example Bilbao and Vitoria. Transfer: not included; see price list. You will have 5 lessons per day held in groups of 4 to 12 students. The lessons are very communicative and aimed at a young public, teachers use visual materials such as films, music and the radio. The course includes 3 afternoon activities during the week and one full day excursion on Saturday. The students are supervised by a group leader from the school who coordinates host families, organisation of activities and the students’ overall wellbeing. You will have 2 free afternoons (Tuesday and Thursday) on which you can join a surf, kayak or football course (against a supplement) and Sunday to spend time with your host family. Last day of classes 23/08/2019. The youth course includes full board, teaching materials, an excursion on Saturday and an activity-programme (on 3 week days). Students taking a youth course can book surf, kayak, stand up paddle, cooking or soccor lessons; in that case prices for the combined courses apply. Accommodation is booked from the Sunday before the course starts until the Saturday after the course has finished. Extra nights are available at an additional change. Supplement for special diets when staying with a host family: € 25 per week. The diets that require a supplement are: Vegetarian,Vegan, Gluten free, Lactose intolerant, Halal, Kosher. Please specify on the booking form at which airport you would like to be picked up. UM service: Parents of minor child can apply for an unaccompanied minor transfer upon arrival for € 20. An UM service upon departure costs € 50.
excursion on Saturday and an activity-programme (on 3 week days). In 2019 the school is closed on 25/07/2019, 31/07/2019, and 15/08/2019 . No lessons take place those days, but a full day excursion is organized instead. This course combines the intensive course of 25 lessons with 2 surf classes per week (on Tuesday and Thursdays). Surf lessons take place at Zurriola Beach. Surf classes are taught in Spanish or English depending on the level. Students are placed in groups according to their surfing level. All materials are included. Learn how to paddle board and improve your fitness! This course combines the intensive course of 25 lessons with 2 Stand up Paddle classes per week (on Tuesdays and Thursdays). Stand Up Paddle (SUP) lessons take place at La Concha Beach and are taught in Spanish or English depending on the level. All materials are included. Learn how to kayak well and improve your water safety knowledge! This course combines the intensive course of 25 lessons with 2 kayak classes per week (on Tuesdays and Thursdays). Kayak lessons take place at La Concha Beach and are taught in Spanish or English depending on the level. Students are placed in groups according to their surfing level. All materials are included. Are you a little master chef? In San Sebastian you can learn how to cook a typical Basque menu! •A typical Basque menu:first course, second course and dessert. •A pintxo menu: with pintxos such as "gildas", marinated king prawns, octopus in a vinaigrette, tuna stuffed red peppers, "tan tumaca" and a dessert. You will gain vocabulary about the kitchen and cooking utensils and discover tips and tricks! Staying with a host family is a very fun way to get more familiar with the Spanish way of life and traditions! You will be placed in one of the specially selected host families and spending time with them will ensure you that you can practice your Spanish afer the lessons and improve even faster. Most families will treat you as a member of the family and a lot of students stay in touch with their host for many more years. Accommodation includes breakfast and dinner with the family plus a packed lunch. Families are located 5 to 30 minutes from the school on foot or by public transport.